Lucretia Peabody Hale was born in Boston. Lucretia never married. She wrote fiction for the Atlantic Magazine and other periodicals, and some nonfiction works, for more than 20 years before becoming a successful author of children’s books. 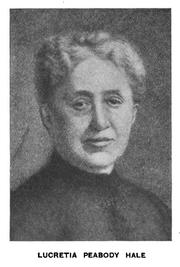 Lucretia P. Hale is currently considered a "single author." If one or more works are by a distinct, homonymous authors, go ahead and split the author. Lucretia P. Hale is composed of 6 names. You can examine and separate out names.